Only six ingredients and you will have a comforting cake full of fresh nectarines or peaches and topped with a delicious egg-sugar layer. A glorious summer morning today! I brought my daughter to the kindergarten taxi and just got home now. I can really hardly imagine a more beautiful summer morning. It has been raining last evening and night, so the temperature has dropped slightly, but although it is still warm and sunny the air smells so nice and has a fresh touch about it. My favorite hours during the hotter summer days! They might not have such a big impact here in Germany, where it is rarely quite as hot as I remember it from home, but I know how I used to love this kind of summer mornings in Romania as well. The hours before the sun went up and it became unbearably hot, it felt like we were only able to breathe in the morning or in the evening when it got dark. I kind of miss those kind of summer days, but I know that I have been gone for so long now, that I would not be able to bear that kind of heat anymore. 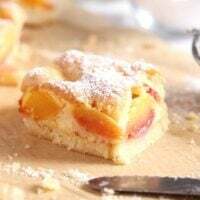 This easy peach cake or nectarine cake is light, it can be eaten from the hand and although sweet and comforting in a cakey-kind of way, it is still fresh tasting and summery due to the many peaches or nectarines you dump on top of it. 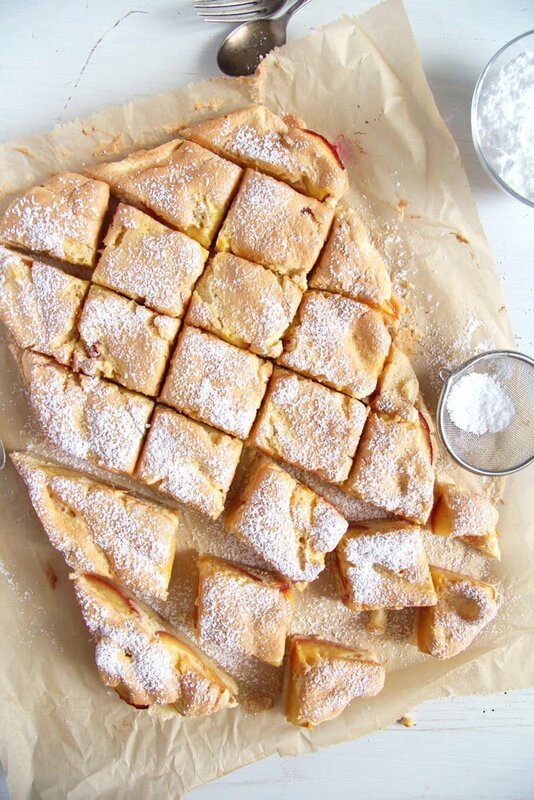 And like I have mentioned it above, this peach cake recipe only needs six ingredients, which makes it a super cheap recipe now when the peaches and the nectarines are so abundant. I made the first layer of the peach cake in the food processor, but you could mix the ingredients with the hand mixer as well. The dough will be rather soft. 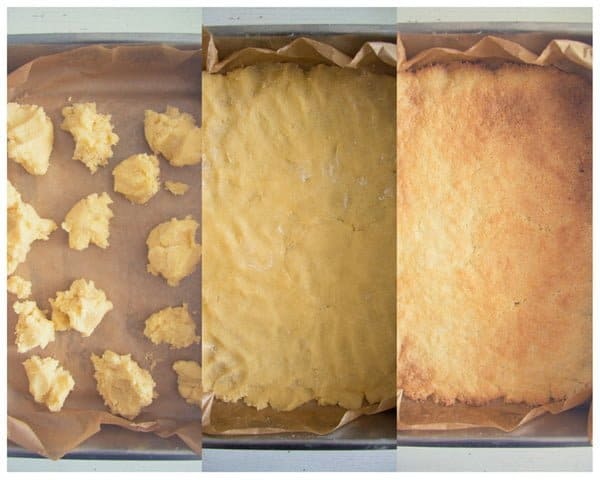 Spreading the batter onto the baking dish is quite simple as well. Give the batter in small heaps to the baking dish and press it down either with a spoon or with your fingers. Flour the spoon or your fingers when you do that to reduce the stickiness. The peaches and the nectarines tend to release quite a bit of juice during the baking process, that is why I bake the first layer of the cake for about 18 minutes first, the base should be nicely golden and almost done at this point. Sprinkling the first layer with some breadcrumbs before adding the fruit also helps against the soaking of the dough with too much juice. 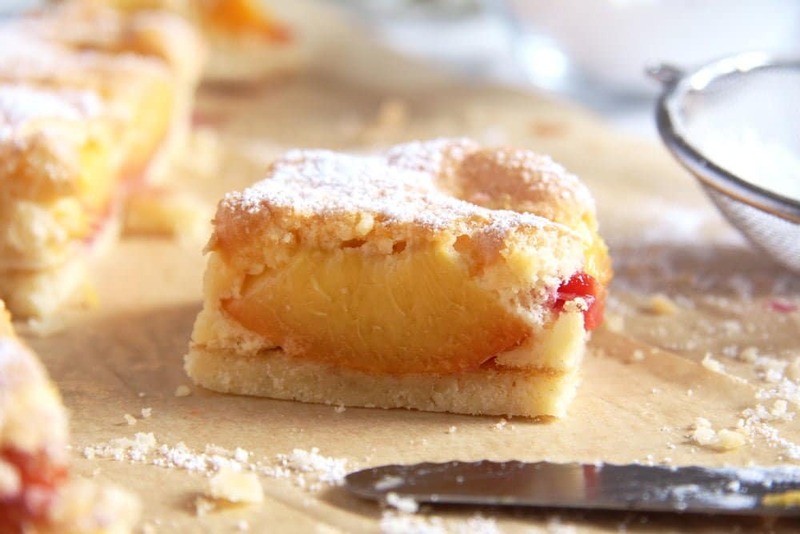 Also, I prefer to use slightly unripe nectarines or peaches for making this Romanian cake recipe with peaches or nectarines. They release less juice during the baking process and keep their shape better. And the fact that they are baked and served on a sweet cake will stop you from noticing that they were not quite ripe in the first place. It should not be difficult to buy slightly unripe peaches or nectarines, I sometimes have the feeling you can only get them in that stadium. 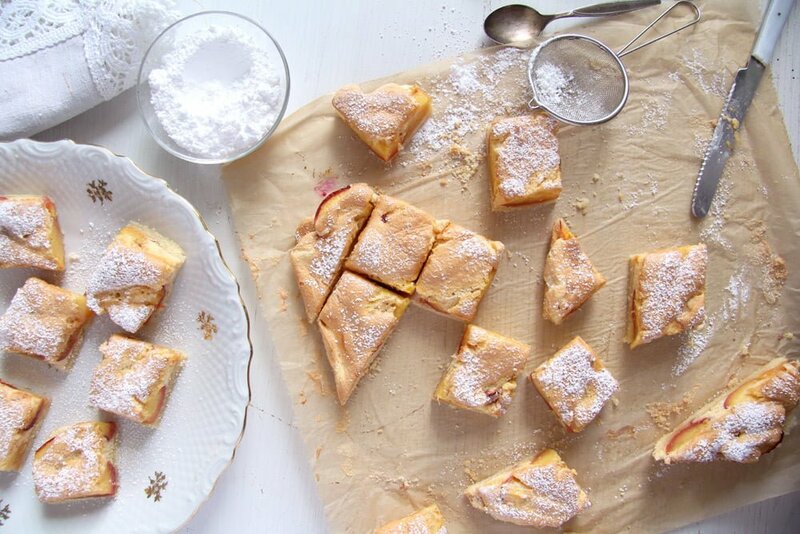 This recipe has its origin in Sanda Marin’s Cookbook, which was first issued in 1936, so it is quite a vintage Romanian cake recipe, I would say. However, as it was usual during those times and later times as well to be honest, the recipe instructions for making this nectarine cake are very vague. The whole recipe is explained in about 10 sentences… an absolute nightmare! What I’ve missed most were the instructions regarding the baking times, there are three different baking steps after all and it is quite difficult to guess when the first layer or the fruit is done and so on. So, I have baked this cake three times already just to make sure I got those times right. Nobody complained though, they all loved the cake, it was gone within one day every time. Fast forward to Juli 2018. 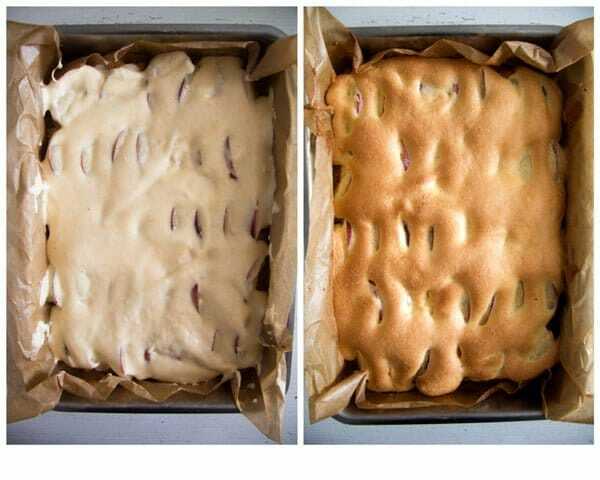 I made this Easy Fresh Peach or Nectarine Cake again and took pictures of the different baking stages. I just wanted to say that the cake was gone in less than 5 minutes. I took it out of the oven, let it cool slightly and placed it still rather warm on the table. It was a battle… I have never seen a cake go so fast! The only change I have made was to bake the base for 3 or 4 minutes longer than last summer. This way we had an amazingly crispy base topped with juicy nectarines and a soft and sweet batter. The perfect summer cake! 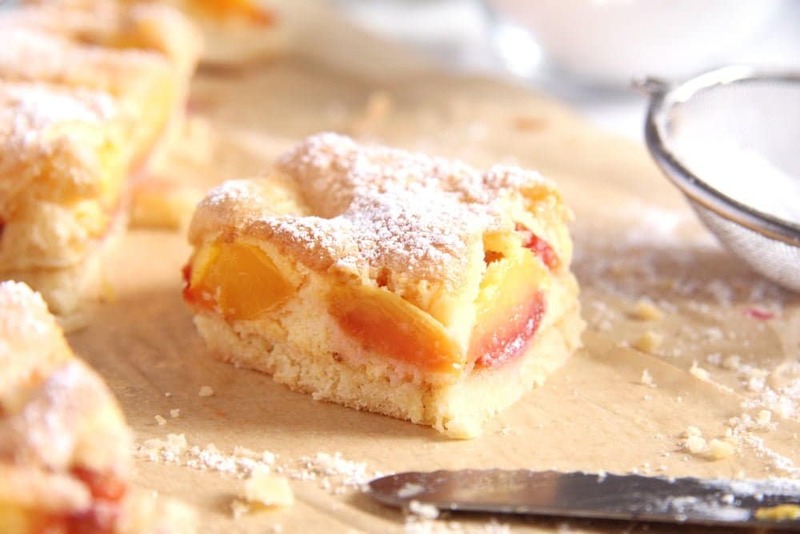 Only six ingredients and you will have a comforting cake full of fresh peaches and topped with a delicious egg-sugar layer. Preheat the oven to 200 degrees Celsius/ 390 degrees Fahrenheit. Line a baking dish of approximately 21x32 cm/ 8x13 inch with baking paper. Place the flour, butter, sugar, salt and egg in the food processor. Mix shortly until the dough comes together. The dough is pretty soft, but if you think it is way too sticky add an extra tablespoon flour. Place the dough in small heaps into the prepared baking dish. Press the dough evenly in the dish with your fingers (you can flour the fingers a bit first) or a floured spoon. Bake for about 15 minutes until lightly golden but not quite done yet. In the meantime prepare the fruit. Stone the peaches and quarter them. If they are very large, cut them into eights. 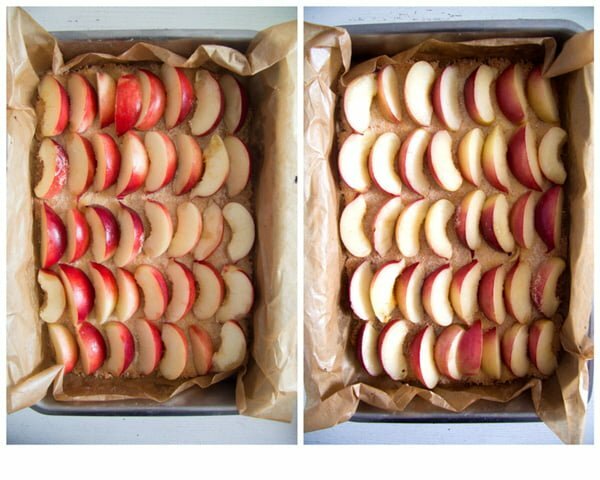 Take the cake out of the oven, sprinkle it evenly with the breadcrumbs and arrange the peach quarters/eights on top. Place back in the oven and bake for another 10 minutes. In the meantime separate the eggs. Beat the egg whites until stiff. Beat the egg yolks with the 3 tablespoons sugar. Add the flour to the egg yolk mixture and incorporate. Fold in the beaten egg whites. Pour this mixture over the cake and continue baking for another 15 minutes or until golden brown and baked through. 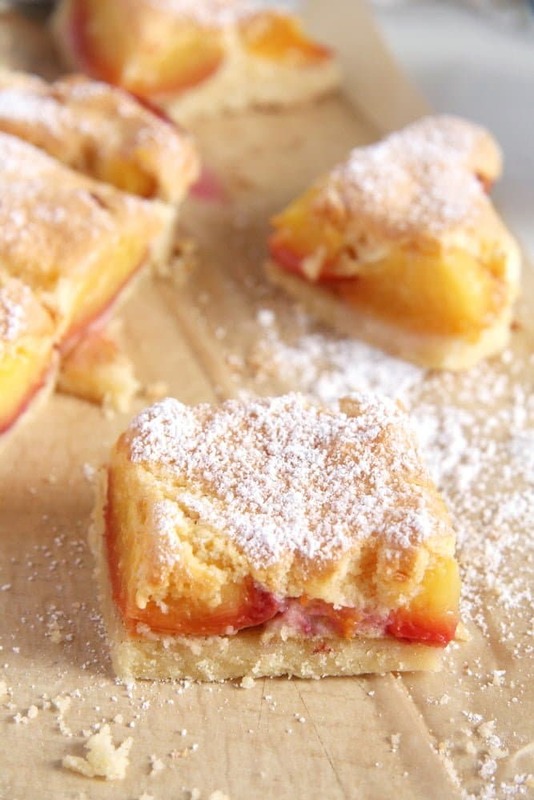 A great recipe to use some juicy sweet stone fruit! The cake looks really delicious, Adina. This cake looks awesome and what a perfect crust! Oh how I wish I had your baking skills. Adina, this cake looks uh-mazing! I love how moist it is. Perfect cake to bake in summer! I’m always looking for a great way to use up fruit. This cake is perfect. Lovely flavour, not rich or too sweet. Really celebrates the nectarines. Not crumbly so makes for a easy lunchbox treat. 10/10! Thank you for the feedback, Lucy. I am so glad you liked the cake.